Preheat oven according to pizza base instructions. Place pizza base on oven tray and spread pizza sauce/tomato paste evenly across base. Sprinkle a handful of grated cheese. Heat a medium fry pan oven medium heat, add the olive oil. Sautee mushrooms in the fry pan with the fresh thyme, stirring regularly. Season with salt and pepper. Once mushrooms are browned and reduced in size, remove from the pan. Keep pan on the heat and add the chorizo, stirring regularly until a little browned and crispy on the edges. Remove chorizo from pan. 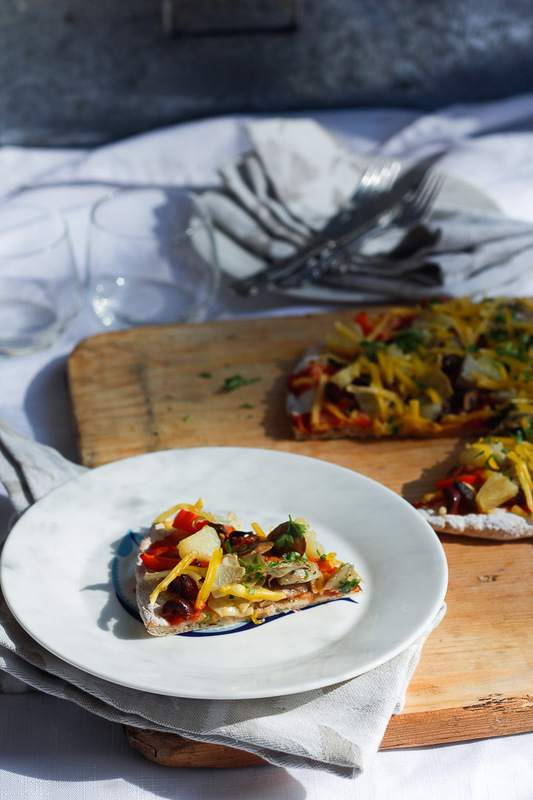 Top your pizza with mushrooms and capsicum, then add chorizo, olives and artichokes. Sprinkle with more grated cheese then place in the oven and cook according to pizza base instructions. Remove when base is cooked (the cheese won’t melt like dairy cheese does so use your base as a cooking guide). Thank you Ruth Meaney for sharing your beautiful recipe with us! © 2019 Toscano Authentic. All Rights Reserved.